Injectable dermal fillers can plump thin lips, build cheeks to help lift jowels, enhance shallow contours, soften facial creases, remove wrinkles and improve the appearance of recessed scars. Dermal fillers are a wonderful, quick, and nonsurgical option for restoring lost volume and softening wrinkles and folds! Facial fillers are given with a very fine needle to ensure comfort. Safe and FDA-approved, dermal fillers are very rarely associated with complications of any kind. Juvederm is a smooth, plant-based gel that mimics hyaluronic acid. Juvederm also provides immediate, visible, and beautiful results! 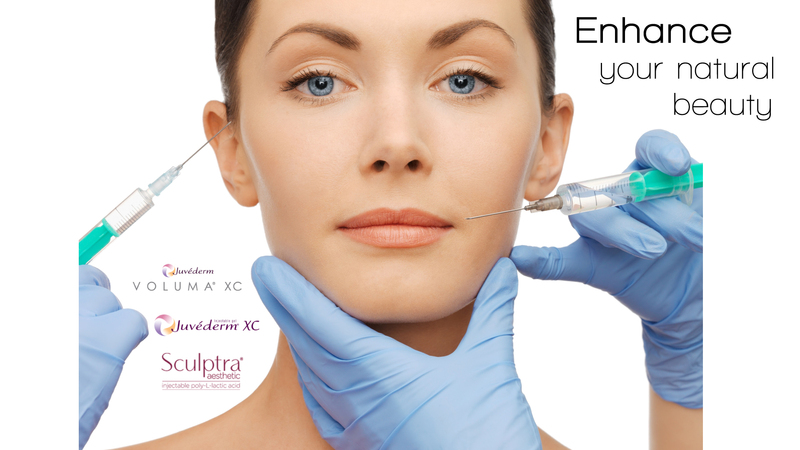 Juvederm Vollure™ XC for laugh lines and marionette lines is a new Hyaluronic Gel filler in the Juvederm family..
As fillers improve, you get to expect a longer and smoother correction. The patented Vycross® technology of Vollure blends different molecule weights to achieve a particularly smooth result. Vycross cross-linking makes the fillers more malleable and easier to inject, further improving the outcome.. Clinical tests showed up to 18 months longevity. Juvéderm® VOLBELLA® with Lidocaine is the latest advancement in the Juvéderm® range of facial fillers, developed specifically for your lips and mouth area. It is a smooth gel that is injected, using an ultra-fine needle. It has been specifically developed as a smooth gel to give a soft, natural feel. The gel fills in lip lines and wrinkles while the hyaluronic acid within attracts and retains moisture, so results can last up to a year. Volbella can also be used under the eyes and in fine lines such as crows feet. Sculptra Aesthetic is a new type of facial injectable made from poly-L-lactic acid, which helps to replace lost collagen. It helps correct shallow to deep facial wrinkles and folds that appear with aging by replacing lost collagen. The main ingredient is a biocompatible, biodegradable synthetic material that has been used by physicians for decades.Sculptra Aesthetic is not an overnight miracle. It is not a quick-fix, but a long lasting treatment. The first facial injectable that gives you subtle results over time by replacing lost collagen. Giving you a more natural-looking appearance, without giving you away. A full treatment of Sculptra Aesthetic, an average of four injection sessions over a few months, can last more than two years. So you have more time to see how sensational subtle can be. Discover anti-age for the modern age. Am I a Filler Candidate? Treatment usually only takes 30-60 minutes depending on the areas you are having treated. The effects of facial filler injections are immediate, but they also often improve over time with the production of new collagen. After treatment with dermal fillers, you should avoid the sun, alcohol, cold outdoor activities, and exercise for 24 hours. You may reapply your makeup and go home or return to work after you have had dermal filler injections. Most side effects such as mild redness or tenderness at the injection sites, firmness, swelling, lumps/bumps, itching, bruising, or discoloration are temporary (less than 5 days).